Loudspeakers, amplifiers, intercoms, microphones, mixers, mounting hardware and wiring for public address systems. 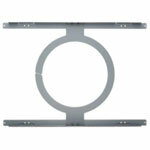 HFCS1 Speaker Accessories, Steel ring to mount ceiling speakers, 12" Dia. x 3/4" D. Includes C-ring and bridge for OCS1 and HFCS1.